This is a stunning premium range Sweet Plum twin bonsai composition. These 2 bonsai trees are potted into a lovely natural forest green pot with matching drip tray. These bonsai has a wonderful character trunks and very pretty canopy. The bonsai are styled on old gnarly orchard trees. A Chinese temple is included. Would make a wonderful anniversary bonsai gift - 2 bonsai in harmony together. 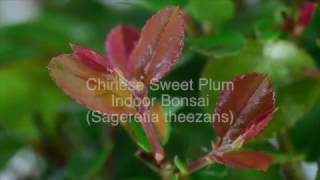 This is a lovely twin Sweet Plum bonsai composition, in forest green pot.